Sorry about that. I’ve been cranking on something really big for January (a few things, actually). I have an awesome queue of things to write about. Which I love. It’s the best when there’s a backlog of things simmering in my head, waiting to get out. Best for me and for you, because that way you read something reasonably impassioned and interesting and I don’t bore either of us senseless. 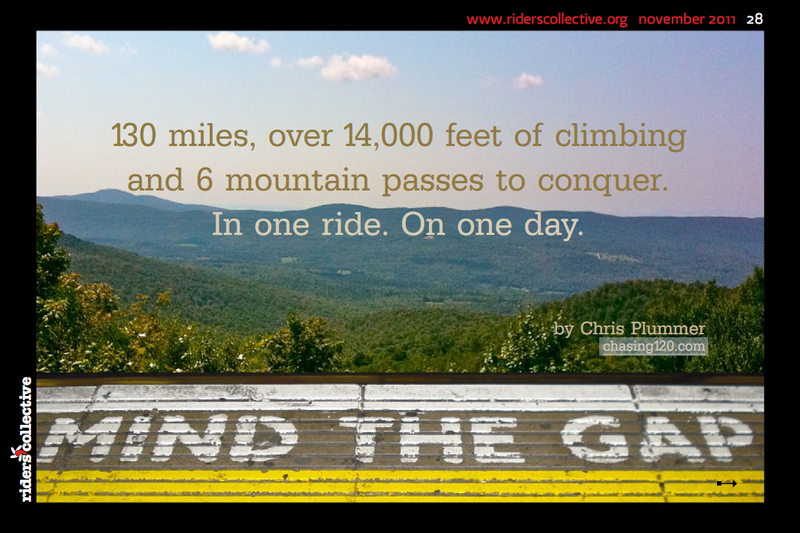 In the meantime, Rider’s Collective took an interest in my 6 Gaps story, and published it in their November 2011 issue. This was the first time I’ve ever had any of my work here published, and to see someone dress it up was just f*cking awesome. I love what they did with it. It’s been a few years now since that ride, and it seems like I just did it yesterday, especially when I re-read this. For so many reasons, equal part good and not-so-good, that ride will never be like that again. Nice work brother. I hadn't read that in a while, good to see you got the Apollo Creed quote in there.